When your students reach the end of their high school careers, they are full of anticipation for summer plans and future academic pursuits. If you are an academic administrator, a teacher, or a parent of a graduating student, you do not want to be full of stress over whether or not they have the right graduation cords, and if their cords will get there in time for the ceremony. At Honors Graduation, we try to keep things as simple as possible for you. Our order forms are easy to understand and quick to get through, and if you have any problems, your phone call will always be taken by a person; no obnoxious machines and menus to sort through. Our high school graduation cords come in a huge assortment of colors, so you will definitely be able to find the right graduation cord for your high school graduate. At a standard length of 70 inches and width of 1/4 inch, our high school graduation cords are sure to be exactly what you need for your school commencement. Our graduation cords are also made of the highest quality rayon, and are sure to last, not only through the graduation ceremony, but also as a memento of high school memories for year into the future. But the best part of ordering through Honors Graduation is the amazing low prices. A single cord is only $6.00, and if you order five cords or more, you get our bulk rate, starting at $5.00 per cord! We also have a low flat shipping rate of $4.00, no matter what size your order is. When it comes to rewarding your students for their hard work throughout high school, nothing could be better than a graduation cord that represents their individual talents and success. Ordering from Honors Graduation will make your life simpler, and your students feel more appreciated for all their diligence in finishing high school. 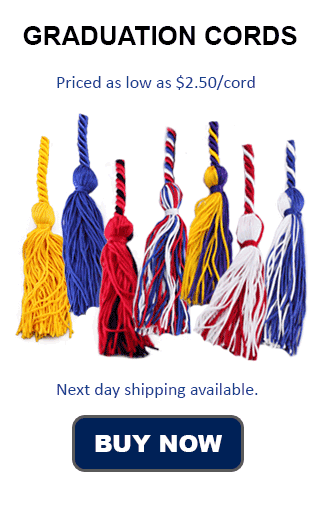 Order your high school graduation cords from Honors Graduation today and ensure that your students are given the best possible commencement gift: the gift of honor and respect.